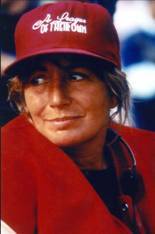 Penny Marshall – Now in a "League of Our Own!" Famed Movie Director and avid sports fan Penny Marshall will be a guest at the 26th National Sports Collectors Convention. Marshall will be signing autographs each day of the event, 7/28-7/31. Her love of sports is evidenced by her attendance at Lakers games and other major sporting events year-round. Penny is an avid collector and is looking forward to seeing all the great collectibles at the National. Tickets for autographs are currently available on the National web site. Inspired by the little known story of the All-American Girls Professional Baseball League of the '40s, Marshall directed and executive-produced A League of Their Own, which starred Tom Hanks, Geena Davis, Rosie O’Donnell and Madonna. It was a major box office hit and the second Marshall-directed film to surpass the $100 million mark. Marshall was born and raised in the Bronx. She attended the University of New Mexico, majoring in math and psychology. She then moved to Hollywood and made her debut in The Danny Thomas Hour, a drama anthology series. During the next several years, Marshall appeared in several small feature film and television roles. An appearance with Cindy Williams in a segment of the series Happy Days introduced the characters of Laverne and Shirley, which spun off into their own landmark, long-running comedy series. Marshall’s other television credits included regular roles on Mork & Mindy, Taxi, The Bob Newhart Show, The Odd Couple and The Mary Tyler Moore Show. Penny Marshall made her feature film directorial debut with Jumpin’ Jack Flash, starring Whoopi Goldberg. Tom Hanks starred in her production of Big, which garnered him his first Academy Award® nomination for Best Actor, and the film earned nearly $115 million in box office receipts. She then directed Awakenings, nominated for an Oscar® for Best Picture and starred Robert De Niro and Robin Williams. Marshall also directed Renaissance Man, starring Danny DeVito, Gregory Hines and Mark Wahlberg, The Preacher’s Wife, starring Whitney Houston and Denzel Washington. Her most recent directorial effort was Columbia Pictures’ Riding in Cars with Boys, starring Drew Barrymore. She developed the Russell Crowe boxing drama Cinderella Man for Universal Pictures, on which she served as producer, which was directed by Ron Howard. Marshall also produced the big screen version of Bewitched, starring Nicole Kidman and Will Ferrell.